Kings of Chicago is a first for Net Entertainment, as they’ve opted to combine the popular game, Texas Hold’ Em, with a Video Slot. At first, it sounds a little odd; there’s already hundreds of Video Poker games out there – how would a Video Slot be any different? But, as you’ll soon see, Kings of Chicago manages to pull off the Texas Hold’ Em theme just perfectly, and with great base-game wins on offer, alongside an exciting bonus-round, Kings of Chicago is a perfect crossover for players who enjoy Poker, and slots. The game itself uses five reels and just five pay lines, but don’t think that’s any reason for disappointment – in fact, as you’ll soon see, Kings of Chicago is really in a league of its own, both in terms of the way it plays, AND in the profit-potential the game offers! This 1930’s ‘backroom card room’ inspired slot combines the dangerous, unforgiving world of mafia gambling, with a modern-day touch, and you’ll see this through the design of the game; set on a green felt, there’s chips, banknotes, and… oh; the gun. While simplistic in design, it’s the way the game plays that makes it so appealing; more on that in just a moment. 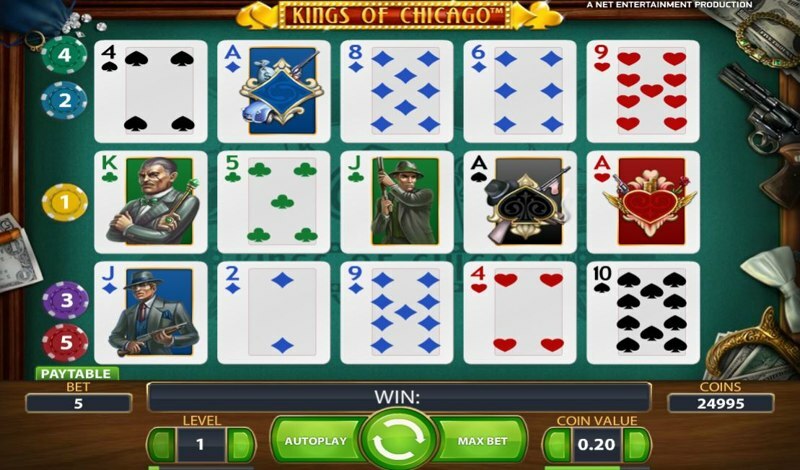 Kings of Chicago is also designed to be used on mobile devices, which means phone and tablet users can load and play the game without any issues, thanks to Net Entertainment’s HTML5 technology, which ensures all of their titles run smoothly in most mobile Internet browsers. Kings of Chicago refers to a spin as a “deal”, and each deal sees the five reels filled with playing cards, from 2 through Ace. There’s also a Joker, which, when part of a win, doubles the win in question. 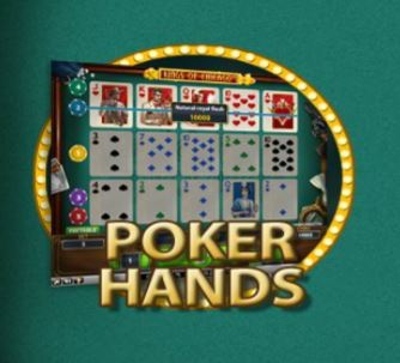 To keep the gameplay simple, and to stop players getting headaches, the reels don’t actually spin; instead, an arm-less hand deals the cards, as though you were playing a Casino Table Game, and like most Net Entertainment games, there’s a “Quick Spin” option, if you find the speed of play a little slow for your liking. 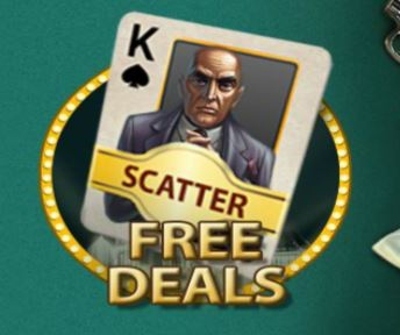 The free-spins equivalent in Kings of Chicago, trigger the free deals by landing three or more of the scatter symbols in view. Interestingly, the scatter symbols are simply normal symbols with a golden line through them, and these change, so any of the base-game symbols can appear as scatter symbols. If you land 3 of the scatter symbols you’ll be awarded 10 free deals, with 4 giving you 15 free deals, and 5 awarding 30. During the free deals, all your wins will be multiplied by 2X, and it’s also possible to re-trigger, simply by revealing more scatter symbols during the deals.